Note – this blog-post discusses the use of the 13553 – 13567KHz band under FCC Part 15 regulations in the US. Although it is a worldwide allocation, rules vary according to where you are. Off the top of my head, I do know that there are HiFER beacons operating in some countries on the European continent, but that is the extent of my knowledge of this type of operation outside the US. Also – this post describes a rather cumbersome method for compiling and flashing the code. Atmel Studio is a bit overkill for this application. My defense is that I was (and still am, actually) very new at this stuff! An easier way to program the ATTiny13 is to download the Arduinio I DE (if you don’t already have it). You don’t even need an Arduino board if you have an AVR programmer and a target/adapter board. You can just paste the code into the Arduino IDE, and use that to upload the program (it will compile it in the same step). You will need to download the definitions for the ATTiny 13 as described here. Before saying anything else, I must note that even though the earlier projects which were named after my cats were not my designs, I did at least contribute enough of my own input that I could perhaps get away with naming them. I’m not sure that is the case with this venture, as I simply re-purposed it for a slightly different band and usage. However, the urge to name things around here after my cats is strong, so what I am calling The Sproutie Beacon, is really an original Hans Summers QRSS TX, modified slightly for the 15553 – 13567KHz HiFER band. I have long been fascinated with clandestine and pirate radio stations. The UK has a long and hallowed history of pirate operation, since Radio Caroline and the other pirate ships began to grace the airwaves in the 1960’s. When I was in my teens in the 70’s, Caroline was still on the air, as was a newcomer to the pirate ship scene, a station called Laser 558. Laser 558 was, like the other pirate ships before it, stationed just outside British territorial waters, in international waters. It differed from the other pirates in one very noticeable detail though – it had American DJ’s, and was programmed like a US Top 40 station. To a British listener who was used to DJ’s talking quite a lot, the sound of American accents and near-continuous music, as dull as it might sound to a Stateside listener, was quite thrilling to these teenage British ears in the 1980’s. London is well-known for it’s many land-based pirate broadcasting stations on the FM band, but there weren’t too many outside the big cities. As a teen in the 80’s growing up in the Midlands, we did have a fairly high-powered pirate station on the AM MW broadcast band, with a wide coverage area, called Sunshine Radio, which I enjoyed listening to greatly. When living in Los Angeles in the 1990’s, I was asked to DJ on a local FM pirate by one of the resident presenters, but politely declined, as I was already working in my chosen career, doing DJ, voice-over and production work. I was getting my DJ jollies for about 50 hours a week – and getting paid for it at that point, so said no to an opportunity that a few years earlier, I would most likely have jumped at. Los Angeles was not known for pirate activity at all – the area was almost entirely devoid of it, but this one station was a notable exception. It was known as KBLT. The founder, Sue Carpenter, even wrote a book about it, called “40 Watts From Nowhere”. Written from her perspective, and relating the trials and tribulations of running a pirate radio station that was on the air nearly 24/7 out of her apartment in the Silverlake district of Los Angeles, it’s a good read for anyone interested in the subject of pirate broadcast stations. Then, in 2008, after moving to San Francisco, I was tuning around the shortwave bands in CW mode from my apartment in Ocean Beach one day, and heard a series of dits on approximately 4096KHz, Further investigation revealed that it was one of a cluster of unlicensed (and not legal) beacons operating from various locations in the California deserts on various frequencies centered around ~4096/4077KHz and 6626KHz with powers of the order of a few 100mW’s. All of them operated from solar power. Some also had batteries and could transmit 24/7, while others had only solar panels and were daytime only beacons. Even Jason NT7S could hear one of them from his QTH in Portland, Oregon – propagation was good on a regular basis back then. There are a number of these beacons, most of them in the deserts of the south west. Some send dits at various speeds, some send letters in Morse code. There is also one that sends the ambient temperature in Morse. They are discussed, with reception reports, over on the HF Beacons forum at HF Underground. If, from all of this, you conclude that I would still be interested in running some kind of pirate operation, you’d be partially correct. I say partially because, in truth, although I enjoy listening to the clandestine activities of others, I wouldn’t want to do anything that might, even in theory if not in practice, jeopardize my ham license. I’d love to take a QRP solar-powered HF beacon out into the desert and leave it there, sending it’s valiant little signal, day after day, year after year, and checking the online reception reports from time to time. It would be interesting to see how long it would last. I read a report from someone who did install such a beacon, and his description was quite lyrical. He described how, whenever he was out hiking, fishing, or otherwise enjoying the great outdoors, he would take his portable shortwave radio and listen out for his beacon, thinking of the little transmitter out in the remote desert, courageously sending it’s diminutive signal across the great expanses of wilderness. Very evocative stuff. My first “proof of concept” at putting together a beacon for this band was to connect an N0XAS PicoKeyer in beacon mode to my Pixie 2 transmitter. With the PiicoKeyer, if you insert the prosign BN at the end of stored message #1, it will automatically repeat. Unfortunately, my older version of the PicoKeyer will not power up again in beacon mode if power is lost. This was taken care of in later versions, but it meant that I wouldn’t be using this particular version of the PicoKeyer in the final version of the beacon. My Pixie 2 put out about 170mW on it’s original frequency of 7030KHz when powered by 12V, but this dropped to an encouraging 5-10mW at 3.6V (3 x 1.2V NiMH cells in series). For the final version, I wanted all the electronics to be on one single board. At that point, I was thinking about purchasing a PicoKeyer chip from N0XAS and building the keyer, Manhattan-style onto the same board as a Manhattan-built transmitter. Then I remembered the Hans Summers QRSS Transmitter that I had built a few years ago. After a brief flirtation and a lot of fun with QRSS on 30M, the board sat languishing in a box. A little experimentation showed that it would still work down to voltages below 5V, and with the drive trimpot, I figured I’d be able to adjust the drive to give an appropriately low output power. Even better was the fact that on the QRP Labs website, there were details of a mod by Aldo IW2DZX for altering the output from FSK to straight on-off modulation, which I happened to want with this beacon. Getting the QRP Labs QRSS TX on the HiFER band was straightforward. 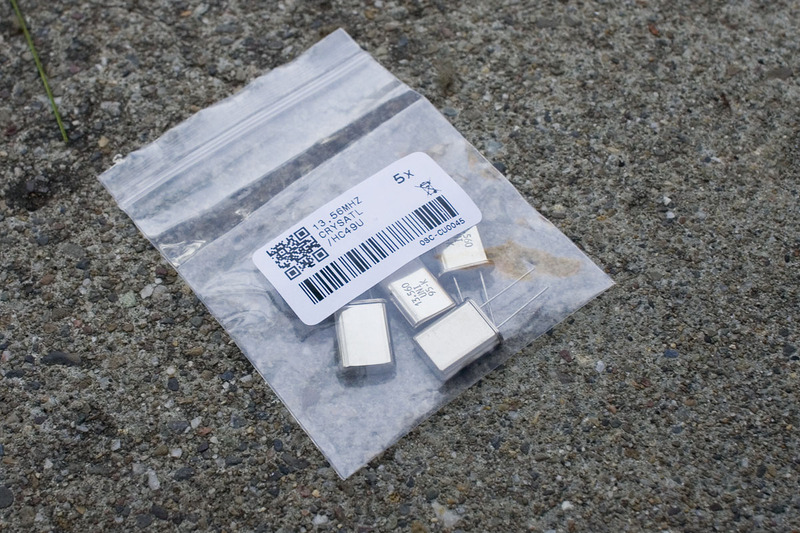 A pack of 5 x 13.56MHz crystals was purchased from an eBay seller. I chose HC49/U crystals over the more popularly available HC49/S, as I have read that the former tend to pull over a wider frequency range, due to the crystal cut. Receiving this pack of crystals in the mail was exciting. Think of the possibilities! The jumpers on pins 5, 6 and 7 of the ATtiny13 are used for programming the sending speed. Refer to the original kit instructions for programming the speeds. Hans’ firmware allows 6wpm, 12wpm, and 6 QRSS speeds ranging between QRSS1 (1 second dits) and QRSS20 (20 second dits). The original schematic didn’t include the 3 x 10K pull-down resistors on these pins. I included them, as my TX wasn’t transmitting the selected modes. If these pins are left without pull-down resistors, then an unconnected pin might be incorrectly interpreted as “high” by the chip. The original circuit used a reverse-biased red LED to provide frequency-shift keying. This was removed, along with a 470K resistor and a “gimmick” capacitor, and a 2N3904 transistor, 22K resistor, and 0.1uF capacitor added to key the PA transistor. Also changed were the values of inductance and capacitance in the output low-pass filter. To cap off the mods, a 3.3V regulator was added. Because of the strict power limitations on this band, I wanted to ensure that the TX was running close to the maximum allowed power at all times, with minimal variation due to power supply fluctuations. Although I modified my existing QRP Labs original QRSS transmitter, if you don’t have one to modify, you could build it from the schematic above, Ugly-style or Manhattan-style. A little transmitter built using MeSQUARES and MePADS would look quite nifty, methinks. The values in the schematic are the final values for the HiFER band. If you decide (with the help of the info on Hans’ site) to build it for QRSS operation as an MEPT on a ham band, you can run it from 5 – 6V for increased TX power output. I believe it can put out up to 150mW. On the HiFER band, of course, we don’t want anywhere near that much power, so a 3.3V regulator does the trick nicely. If at this point, you don’t have a functioning keyer chip, you can verify that the transmitter is working by connecting pin 3 of the DIP socket to pin 8 (the +3.3V supply), which will activate the keying transistor and turn the PA on. You can listen to the little transmitter on a nearby receiver, or look at the output on an oscilloscope (or both). Now to decide on a callsign, or other beacon ID that you want to send. There are no ID requirements when operating under Part 15 regulations. Indeed, this band isn’t even intended for these types of communications, though this usage does fall within the rules. This leaves you, the fledgling HiFER control operator, free to transmit any ID you want. I decided that I wanted the letters “SPT” in honor of my youngest kitty, Sprout. But how to go about changing the firmware? This was no mean feat for a person like myself, who has studiously avoided all types of non-analog electronics my entire life. This next part of the narrative will be blindingly simple for many, but is directed at people like myself, who are fairly new to the task of compiling and flashing code to a micro-controller. You have to search around a bit to find this fairly basic information in a form that we newbies can understand, so I thought I’d attempt to provide a tutorial of sorts here. For those who know what they’re doing in this area, please feel free to add comments and correct me. The code, written in C, is posted on Hans’ personal site here. The general page on the keyer chip on his site is here. By the way, if you haven’t seen Hans G0UPL’s personal site, you’re in for a treat. It’s a treasure trove of personal projects and just screams “home-brewer/experimenter”. There are many happy evenings of reading on it! Please note that I have removed the code from this page, as I was having trouble getting it to display correctly. 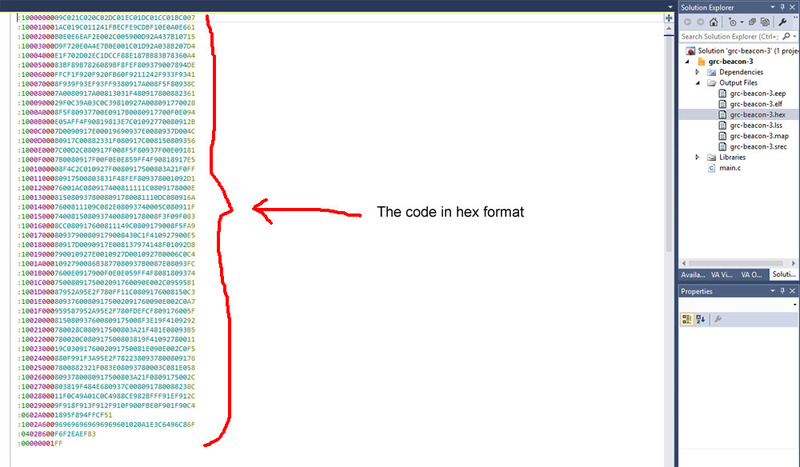 If you had pasted the code from this page, it would not have worked. Please feel free to e-mail me (I am good in QRZ) – or leave a comment underneath with your e-mail address, and I can send it to you. Copy and paste the code directly from into a simple text editor, such as Notepad, if you’re using Windows. You can include the instructions at the beginning if you want – the compiler will know to ignore them. In the text editor, you can alter the code to include the callsign/message of your choice (no more than 8 characters, including spaces), then save it. You can name the file whatever you want, but make sure that the file extension is .c so that the compiler knows what it is. Before compiling and flashing this code onto the ATtiny13 micro-controller, the other thing you will need to know is how to set the fuses on it. This beacon circuit uses an ATtiny13V, but I believe the ATtiny45 or ATtiny85 could also be used, as the only significant way in which they differ is that the later versions have more memory. The fuses determine basic operating parameters of the chip, and only need to be set once, though they can be reset, if you wish. After setting them you can re-flash the firmware as often as you like, and the fuse settings will remain the same, unless you purposely change them. The code for the beacon, as written in c, cannot be flashed to the ATtiny – the chip wouldn’t have a clue what to do with it. Before it can be flashed, the program has to be converted into a format that the micro-controller can recognize, through a process called compiling. It might be overkill to use such a big suite simply to compile a program, but Atmel Studio was the first free one I came across, and it worked, so I used it. Download the latest version of Atmel Studio (at the time of writing, it is version 7). It’s a big download – several hundred MB, if I remember correctly, so depending on the speed of your connection, it may take a while. A dialog box appears. On the left-hand side, under “Installed”, select “C/C+++” and then on the right-hand side, select “GCC C Executable project”. 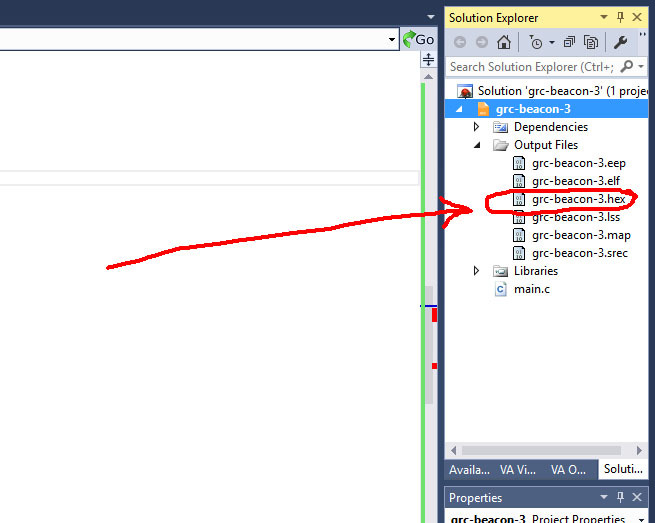 At the bottom of the window, you can name the project “grc-beacon” (or whatever you want to call it), and select where you want the generated files to be stored, unless you want to stick with the default location. Then click “OK”. Then a device selection box appears. You’ll want to pick ATtiny13, unless you’re using an ATtiny45 or ATtiny85. I haven’t tried the latter 2 devices, but believe they will work for this application. Then click “OK”. You can insert your code where indicated, but at this point, I chose to completely delete everything that appears on this screen, and paste the code into the window. If you have already edited the code in a text editor to include your desired callsign, then no further changes will be necessary. If you are still using the code exactly as displayed on this page, you can at this point edit callsign “GRC” out and replace it with your callsign. Remember to also alter #define MSGMAX to match the number of characters in the callsign +1 (if a change is necessary). For the callsign GRC, that will be 4. If, for instance, you were using “DOGGIE” you would set it to 7. That’s it. Simple! The ribbon cable that connects the AVR programmer to this target board can be inserted the wrong way, as the header connectors are not polarized. I opened up my AVR programmer and traced the pins from the ATtiny45 in the programmer to ensure that they would be connected to the correct pins on the ATTiny chip plugged into the DIP socket on the target board. Like goes to like, i.e. reset pin is connected to reset pin, MISO is connected to MISO, MOSI to MOSI, SCK to SCK, +vcc to +vcc, and gnd to gnd. P.S. – when programming the ATtiny chips, I don’t fully insert them. With high quality machined sockets, a gentle push makes good enough contact, and makes it easy to remove the chip without deforming the pins. In fact, I did the same when plugging the chip into the beacon board and it has been running fine now for a few weeks. I do this in case I decide to reprogram the chip a few times before deciding on the final callsign. Another way of treating the pins gently would be to use a zero insertion force (ZIF) socket when programming the chip. Tayda have them for a low price, or you could use this target board from John KC9ON, and his company, 3rd Planet Solar. The USBTinyISP Programming Adapter from 3rd Planet Solar. Photo reproduced with kind permission of KC9ON. AdaFruit have a useful instructional on how to use their AVR programmer, which applies to any USBTiny ISP. If you haven’t done this before, refer to their instructional, install WinAVR, and become familiar with it’s use. I’ll assume you know this stuff in the following paragraphs. I burn the fuses first, in a separate operation. That way, I know they are set, and it makes subsequent programming operations simpler (with fewer things to potentially mistype at the command prompt). With the USBTinyISP plugged into your computer via a USB cable, as well as the target board, make sure the ATtiny13 (or ATtiny45 or ATtiny85) is plugged in to the 8-pin DIP socket on the target board, and you are ready to flash. – indicating that the Windows Desktop is the current directory. You’ll also see some other stuff to the left of the word “Desktop” but exactly what, will vary, depending on your particular set-up, so I won’t confuse you. Then hit return, and because you didn’t specify the target part, the programmer will tell you so, and give you a long list of all valid parts. I’m not showing it here, because the list is too long to fit on the screen without scrolling but near the bottom, you’ll see the ATtiny13, and it’s abbreviation, which is simply “t13”. Hit return, and if you get something like the following, it means you have successfully written the fuses. Congratulations – you don’t have to do it again! If you want, you can set the fuses when you are flashing the hex file, but there is the potential to goof up, set the fuses incorrectly, and render the ATtiny incapable of further use. I’d rather do it in a separate operation and then not have to worry about it again. If you have already built/modified the beacon transmitter, you can plug the ATtiny chip into it, and should hear the sweet sounds of your beacon ID being sent repeatedly on a nearby receiver (with a brief pause between ID’s). You can also connect a crystal earphone or other piezo-electric transducer to pin 2 of the chip to hear sidetone, as a check. That’s a small dummy load plugged into the BNC connector. Once connected, you can measure the peak to peak voltage across it with an oscilloscope, and use that to calculate the output power. Although you can’t see them, I fixed 4 little vinyl bumpers to the bottom of the case. Once you have this little powerhouse in an enclosure, you’re ready to set the output power with the 2.2K drive trimpot. Ideally, you’d be able to accurately measure the field strength at 30 meters from the antenna and use that as your yardstick. This is what K6FRC did when setting up his “FRC” HiFER beacon. IIRC, he runs 1.8mW into a groundplane. I saw an online posting from him in which he said that he was running very close to the maximum permitted field strength at that power level (he has access to a field strength meter). As I don’t have an FS meter, I chose to go with the results from W1TAG’s paper and chose 4.6mW into a dipole as my goal. If you have an oscilloscope with a bandwidth high enough to measure voltages at such frequencies, it is a useful tool for measuring the output power of your beacon. As the power is specified in terms of the field strength it generates, there is no need to locate the transmitter close to the antenna feedpoint in order to minimize losses. If the regulations specified a maximum power out of the transmitter final, then this would be a worthwhile approach. This is the case with some Part 15 allocations (such as the one for the MW AM broadcast band). However, in this band, we are free to calculate the loss of the feedline and adjust the transmitter power accordingly. This means that the transmitter can be located indoors, and away from the extremes of weather and temperature. With my MFJ-259B, I measured the loss of my 50 feet of RG8-X at about 0.7dB, and figured that a transmitter output power of 5.4mW should result in about 4.6mW at the antenna. Using this online calculator, 5.4mW translates into a peak-to-peak voltage of ~1.47V into 50 ohms. With the 3.3V regulator in circuit, the maximum power output was only 10mW,so adjusting the drive to produce 1.47V peak-to-peak on the scope was fairly easy. Incidentally, the backwave is very audible when you are close to the transmitter. The backwave is the carrier that is still radiated from the antenna when the keying is off. This happens because we are keying the final, so that when the key is “up”, some of the signal from the oscillator still leaks through the PA and into the antenna. I measured the backwave on this transmitter as 01.mW, and it remains at the same level regardless of where the output power is set. Granted that at lower output levels, such as 5.4mW, it is a greater fraction of the power when the key is “down”, but although I could hear the backwave in my immediate neighborhood, it gets lost in band noise pretty quickly. 0.1mW is about 34dB lower than 5.4mW, meaning that if someone is hearing the beacon at S9 +30dB, then the backwave will be a little over S8. Realistically though, anyone who is not really close to it will not be hearing the mighty 4.6mW signal at anything more than a few meager S-points at most, relegating the backwave into the noise. If it really bothers you, you could run the transmitter from a 5V regulator, set the output power higher, and then reduce it with an attenuator pad in the output circuit. That would lead to less backwave in the antenna. I didn’t bother about it. The “SPT” Sproutie Beacon is now sitting in my shack, pumping it’s plucky little signal into the ether 24/7, and has received 2 “DX” reports so far. The first was from Jeff KF7RPI, who heard it at his QTH in Portland, Oregon, briefly at a 239 – 339, before it faded back into the noise. He is about 530 miles from me as the crow flies, which is pretty good for such a QRPp signal. The second report was from Bill Hensel on the LWCA message board. He was hiking in Pike National Forest when he heard SPT one day at 1845utc (also briefly) on his KA1103 portable receiver. Bill was about 900 miles distant from me, so that is also exciting. These are the only 2 reports SPT has received so far, but it is encouraging. Some folk do run grabbers on this band and look for QRSS signals. I’m thinking that if SPT’s 4.6mW signal can be heard at 900 miles while at 6wpm, it could go a lot further if it were sending much slower. However, I do like being able to decode it with my own ears, so will keep it at 6wpm (or maybe 12 wpm) for the time being. Incidentally, if you want to put a HiFER beacon on the air with the minimum of fuss, the Ultimate 3S QRSS/WSPR transmitter kit from QRP Labs will operate on any frequency in the HiFER band, thanks to it’s Si5351 frequency synthesizer. The LPF for 20M should work fine for attenuating harmonics. As this kit is capable of producing far more power than Part 15 regulations allow, it is your responsibility to limit the output power if you operate this transmitter on the HiFER band. The Ultimate 3S will do multiple modes and bands – it’s a do-it-all-in-one MEPT, really, and at a very affordable price. If you hear the SPT beacon on 13558KHz, please send a report – either to the e-mail address listed on my QRZ account, or as a comment underneath this post. Reception reports will be very eagerly received. One gentleman in Seminole County, FL, reported that the area around the SPT frequency was a cacophony of noise in his area, and he stood no chance of hearing it. Those kinds of reports are useful too. If you put your own HiFER beacon on the air, do introduce yourself on the LWCA message board, and John can include you on the list of known active HiFER beacons. 4.6mW of legal, unlicensed pluckiness and grandeur, hiding out in a diecast box. The SPT HiFER beacon is currently off the air. Posted in homebrew radio, Part 15 Broadcasting, QRP, QRSS.Tagged FCC Part 15, HiFer, HiFer beacon, ISM band, Sproutie HiFer beacon, SPT beacon, unlicensed legal beacon, unmanned HF beacon. Another super post – I much enjoyed your comments on listening to pirate radio in the 70’s in the UK. Although I was very interested in SWL at the time, I was totally unaware of pirate stations – rather missed the boat on that, so to speak. Your description of loading the firmware onto the AtTiny chip is going to become a classic reference. It also makes me really appreciate the Arduino IDE, which is hiding all that detail about running avrdude. I’ve listened for your beacon on the East coast here a few times, not in any systematic way, but when I’m in the shack on during daylight. No luck yet, but I’ll keep at it. Thank you Mike – you’re too kind. The 2 people who heard it here in the West only heard it briefly above the noise, so while hearing it in the East certainly isn’t impossible, it will be a lot harder, I think. But hey – you never know! Very interesting post, Dave. I wonder how many hams went thru a pirate phase at some point. I did thanks to Dunifer, Panaxis and a few other inspiring folks/companies to the tune of 15 watts on 87.9FM in NJ. A musician friend bought the gear and set up the station to promote his band from the church where he lived/worked as a handyman in Nutley – the band’s music was very un-churchly yet the steeple provided a nice place to hide a 1/4-wave GP antenna. Go figure! I like your idea about a remote unmanned beacon and, as I listen for yours with Yagi pointed at you, I may see if I can repurpose a WSPR transmitter to that band. There’s also a 25-watt solar panel around here somewhere and I’m sure a battery could be found…I’ll let you know if I get something on the air and if I can copy your beacon (I think you made a typo (above) regarding its freq. Also ordered a used copy of “40 Watts From Nowhere” – at $1.21 how could I not! John – it’s great to hear from you. I miss your blog, and know that many others do too. It took me a while to adjust to the fact that it was no longer there. I remember you talking about your pirate days in it. I LOVE the idea of a pirate radio antenna on a Church steeple. It’s the perfect place for it! I have a feeling there are a few of us. I believe Mr Dunifer still sells broadcast TX kits and runs workshops, though he’s obviously a lot less active now than he used to be. The original draft of this post included a brief paragraph about my days in broadcast pirate radio, as a student in the UK. I took over the running of an FM pirate on my college campus that had been going for several years. College stations on the FM band weren’t allowed in the UK then as they are in the US, so we circumvented the law and did it ourselves. The head DJ was in his final year and needed to study more in order to get his degree, so he passed the torch onto me. He ended up working for the BBC, and has been a presenter on a local BBC station for many years now, so it must have good training. He was something of a folk hero to me, as he had previously run a land-based pirate off-campus, in the real world, and had actually been arrested for his involvement. To the 18 year-old me, this elevated him to folk-hero status! After I took over, I recruited many of my friends and associates. One of my flat-mates was our newsreader. He later went on to join the BBC as a financial reporter, a position in which he still serves to this day. I often hear his voice on BBC radio, and think of him reading the news on our valiant and low-powered pirate station that had it’s permanent studio in a broom cupboard on the main landing of our block of flats. The station transmitter was a Rube Goldberg affair, a veritable rats nest of wires. It was unstable, and didn’t have the solid coverage I wanted. The output power must have been well below 1 watt. On taking over, I made it my mission to find a better transmitter. To cut a long story short, I somehow found my way into the world of pirate radio in London. Traveling to “secret” addresses in London, and knocking on doors, only to be greeted with vacant , untrusting stares, before managing to ingratiate myself, was in itself an adventure. I remember finally ending up in a kitchen in the back of a terraced house with a group of kids in their mid 20’s, excitedly talking about home-built UHF STL (studio-to-transmitter) links and remote transmitters, all designed to evade the fast detection of the authorities. Back then in the UK, I think it was the Radio Regulatory Division of the Home Office or the DTI (Department of Trade and Industry) who controlled these things. Very heady stuff! Eventually, these industrious and impressively knowledgeable pirate operators decided to trust me. I was told to come back in a week with £40, and a one-board FM transmitter built to order would be mine (I didn’t have the skills then to build a decent one properly myself). Exactly a week later, I hitchhiked the 100 miles or so down to London. The skilled young builder wasn’t in, but his Mum gave me a one-sided PC board with a multi-stage transmitter, constructed Ugly-style, and took my £40. Excitedly, I hitchhiked back home, up the motorway, and spent the time before semester began, putting this transmitter in a large cookie tin, with a power supply in a separate tin. It was only 1 watt output, but it was stable, with good modulation, and gave us good coverage of the campus as well as the village. Not all the villagers appreciated hearing the inebriated student humor late at night on their FM radios from one overly-exuberant new DJ. A complaint to the University resulted but we disciplined him*, and somehow for the next couple of years, we managed to stick around and avoid the long arm of the law. Fun days! You’ll see a reference to Roky Manson in the book. He was my former co-worker. Cool guy and a big music fan. A remote HiFER beacon with a solar panel, located in a remote area, would be fantastic, and I’m trying to figure out the legalities/ethics of such a move. Let me know if and when you decide to give it a go. The LWCA board is a good resource. *The disciplining consisted of me giving him what is termed in the UK as “a right royal bollocking”. Good stuff, those former outlaws ending up on the Beeb! You’re right – it must have been good training. I think pirate FM is going the way of the dodo now with potential audiences migrating to Pandora, Spotify and other online sources. It was fun while it lasted though, wasn’t it. I remember driving around Nutley and a few other towns and being absolutely amazed at both the range and audio fidelity of the set-up. For the record, it was a Panaxis FME or FMX transmitter driving a 15-watt amp whose key component was a BGY-33 VHF module that I got for free by writing to a supplier, expressing interest and the fact that I would like to “evaluate” it. Not long after helping my friend get set up I learned of Norcal and their latest QRP kit, the Norcal 40A. I built one and, for a long time, had to remind myself that I didn’t need to be secretive in transmitting with it – operating the FM station had made “radio” and “furtiveness” seem synonymous and I often thought to myself “Hey man, I’m legit!” when on 7 MHz! At the time, being legit was a novel feeling. Ham radio eventually took over completely where my radio interests were concerned and my friend continued running the FM station with his band for about another 8 months, then sold it after a few close calls with the law. When I read about the fines being levied against pirate FM’ers today, I’m glad I quit when I did as our government can deliver a financial bollocking of its own! I agree John – kids can get their music and culture so much more easily online now, that the days of radio as being a primary source for culture and information for the general population are firmly behind us. I’ve spent a fair amount of time wishing it weren’t so and for a while a few years ago, tried to convince myself to dabble in pirate broadcast radio again, but there were two realities I had to face. One was that broadcast radio just ain’t what it used to be, and the other was that I’m an old coot now, and just don’t have the same single-minded determination for such things as I used to (as well as the legal thing). It was the classic middle-aged crisis – I wanted to bring back the days of my youth, but they just aren’t coming back! Perhaps you can take your Sproutie regen with you on a field trip some day and copy the beacon with it! Now there’s an idea Doug! Dave … little SPT making you proud up here on Mayne Island, near Victoria … 569 on peaks at noon with deep QSB. Thank you Steve. That’s exciting – a straight-line distance of 772 miles on just 4.6mW is not bad at all! Dave, I am happy to report I heard your beacon via the Chilton Online Shortwave Receiver in Reston,VA. I live in Eastern Kentucky in a town inappropriately called Busy, Nothing happens here, believe me. There is no way to tell the signal strength with that particular radio since there is no S-Meter output on the website. It was copied just above the noise floor on November 22 2015 late at night, i apolagize for not writing down the times. My Grundig G3 was not able to copy SPT due to some interference issues from power lines across the road from me. Nice work though, 2,811 miles. Barry Sallade – that is really exciting. It’s a 2400 miles distance between us, as the crow flies. That’s over half a million miles per watt – great stuff! You have made my night with that report. Thank you! Barry – I can hear something, but can’t quite make out what it is. Will keep trying. How are things going over at Bill’s Hobby Broadcaster site? I frequented those forums for a brief while a few years ago, and really enjoyed the forums. What did you use to adapt the Buddipole to the painter’s pole? Thanks Dave! I’ve ordered one and it will arrive Friday. Can’t wait to try it out on my 24 foot painter’s pole! Hey Dave, I believe I just heard your beacon a little bit ago on the webSDR receiver at the University of Twente in The Netherlands. That would be amazing if it was my SPT Beacon, Jason! Wow, that’s a distance of 735 miles as the crow flies. Pretty good for 4.8mW. Thank you for the report, GeekGoat! Thanks John. I tend to mainly see the flaws when I’m working on something, but I do my best to let things go.